Imemg > IMEMG overview > Facts and figures > What are Insensitive Munitions (IM/MURAT)? reduce significantly the risks of accidents related to the use of ammunitions. Reduce the vulnerability of platforms and resources against unintended or hostile aggression, violent reactions with blast overpressure and fragmentation damages are under control. Are key to INTER-OPERABILITY between the Armed Forces. 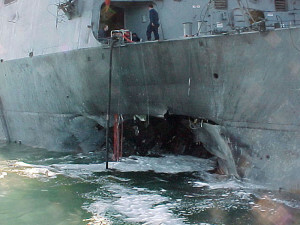 USS COLE off ADEN in 2000 after an attack by a suicide bombers, packed with high explosive materials (17 sailors dead, 39 injured). More about IM Benefits: See the Demonstrations.